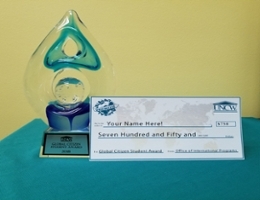 The Office of International Programs has created a Global Citizen Student Award to recognize students who demonstrate a commitment to internationalization and global engagement at UNCW. The recipient will receive $750, as well as other recognition. Congratulations to Alexa Botham and Ashley Krutz, the recipients of the Erasmus+ Grant! The student grant will provide Alexa with 820 euros for travel/flight and 800 euros per month for 5 months while she studies at this dynamic and fast growing institution on the southwestern coast of Spain. Ashley will receive a staff grant that will cover travel and housing expenses (120 euros a day) for 1 week while visiting the university in April. Being a conversation partner to an international student is a great way to make international friendships and expand your horizons. Conversation partners meet with their student for 3 hours per week during the semester. Community Hosts play an important role in easing their students' transition to campus while also providing them an opportunity to engage with American culture in a way they might otherwise not have access to on a traditional college campus. Similarly, students enrich the lives of community hosts through meaningful connection, oftentimes leading to life-long relationships. Share your passion for study abroad! At the start of each academic year, study abroad returnees will be invited to apply to the Ambassador Program. Ambassadors assist the Office of International Programs with promoting study abroad and preparing future participant. The International Programs Student Mentor program pairs returning UNCW students with new international students. The relationship helps new international students acclimate to UNCW and provides returning UNCW students a global experience without leaving Wilmington! An international organization that invites membership from all international and U.S. students. The ISO provides fun events, outings and social gatherings as a way of integrating international students in the life of UNCW and the surrounding community. A joint initiative between the U.S. Department of State and the U.S. Department of Education that was launched in 2000 as an effort to promote programs that prepare Americans for a global environment and to attract future leaders from abroad to study, learn, and exchange experiences in the United States.